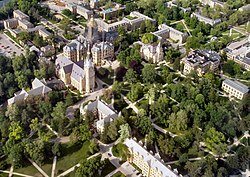 An aerial view of the University of Notre Dame's center campus. 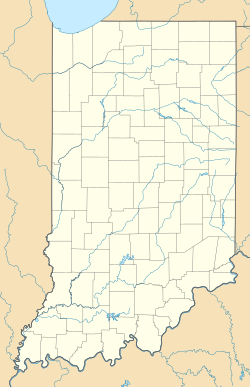 Location of Notre Dame in St. Joseph County, Indiana. Notre Dame is a census-designated place north of the city of South Bend in St. Joseph County, in the U.S. state of Indiana. It includes the campuses of three colleges: the University of Notre Dame, Saint Mary's College, and Holy Cross College. Notre Dame is split between Clay and Portage Townships. As of the 2010 census, its population was 5,973. Holy Cross Village at Notre Dame is a retirement community offering continuing care in Notre Dame, Indiana. It is owned by the Brothers of Holy Cross and managed by the Franciscan Sisters of Chicago Service Corporation. Notre Dame, Indiana, is also the home of three major headquarters of Holy Cross religious communities. On the campus of Saint Mary's College the Sisters of the Holy Cross have their Congregational Administration. The Holy Cross College campus is the location of the Provincial Offices of two provinces of the Congregation of Holy Cross: the Midwest Province of Brothers and the Indiana Province of Priests and Brothers. In addition to these, Notre Dame also holds provinces of the Superior Faith, which are the Eastern Province of Sisters and the Notre Dame Province of Holy Cross. As unincorporated communities do not have a municipal government, Notre Dame, Indiana's government entities are the United States post office and the colleges' police forces. All colleges and universities in Indiana are entitled to an independent police force by law. The University of Notre Dame also has its own fire department and supplies its own water and power utilities, except University Village and Cripe Street Apartments, Notre Dame's family and married housing get their electricity from AEP. A post office has been in operation in Notre Dame since 1851. The United States Postal Service Notre Dame Post Office is located in the northwest corner of Hammes Mowbray Hall, west of East Gate along Juniper Road on the University of Notre Dame campus. Notre Dame is in the South Bend Community School Corporation (SBCSC). The school corporation serves Village Apartments, the designated University of Notre Dame housing unit for students with dependent children and a part of the University Village complex. Village Apartments is assigned to schools based on its University Village Drive location: Darden Primary, Tarkington Traditional Elementary, Clay Intermediate, and Clay High School. At the end of the 2017-2018 school year Fischer Graduate Residence will become the designated housing for students with dependent children, as University Village will close at the end of that school year. ^ "US Board on Geographic Names". United States Geological Survey. October 25, 2007. Retrieved 2016-11-06. ^ a b "American FactFinder". United States Census Bureau. Retrieved 2011-05-14. ^ "Notre Dame, Indiana". Geographic Names Information System. United States Geological Survey. ^ "Indiana Code 21-17-5-2.1. State of Indiana. 2007. Retrieved on January 4, 2011. ^ "Saint Joseph County". Jim Forte Postal History. Retrieved 1 December 2015. ^ "Post Office Location - NOTRE DAME." United States Postal Service. Retrieved on December 6, 2008. ^ "Campus Map." University of Notre Dame. Retrieved on December 7, 2008. ^ "Notre Dame Post Office." ''University of Notre Dame. Retrieved on December 7, 2008. ^ "School District Reference Map (2010 Census): St. Joseph County, IN." U.S. Census Bureau. Retrieved on December 13, 2016. ^ "About University Village." University of Notre Dame. Retrieved on December 13, 2016. ^ "U Streets." South Bend Community School Corporation. Retrieved on December 13, 2016. ^ "University Village Location." University of Notre Dame. Retrieved on December 13, 2016. "Village Apartments: 100 University Village Apt A01 (letter & number), Notre Dame, IN 46556"
^ "University Village." University of Notre Dame. Retrieved on December 13, 2016. This page was last edited on 16 April 2019, at 16:43 (UTC).